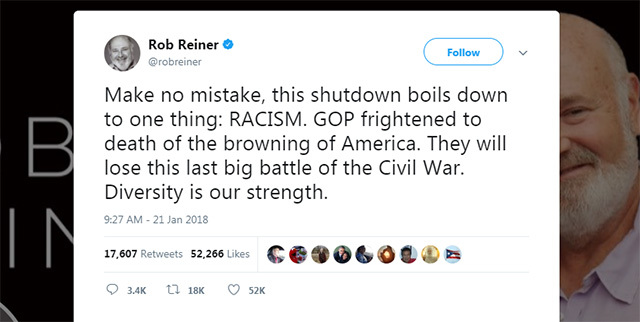 Actor Rob Reiner said Thursday at the African American Film Critics Association Awards that the fight against President Donald Trump is the "last battle of the Civil War." "But then [Donald Trump] gets into office, and there are good people on both sides in Charlottesville, and there are people coming from shithole countries, and it goes on and on and you see the people that he hires that are in his administration, and we see that this now becomes the last battle of the Civil War," Reiner said during his acceptance speech after receiving a "Social Justice Award." "And we're fighting it right now. And we're going to win, we're going to win, but we thought we were on this glidepath, we've been dragged back and we're going to win because if we don't win the promise of what this country started as, which is we are all one, we are all created equal, that promise will not be realized unless we can overcome what has happened in this last election. And I know we will," he said. Reiner said in January that the government shutdown was not a mere budget dispute, but part of a race war over the "browning of America." "Make no mistake, this shutdown boils down to one thing: RACISM," Reiner said on Twitter. "GOP frightened to death of the browning of America. They will lose this last big battle of the Civil War. Diversity is our strength." The Hollywood Reporter's Roger Friedman reported in 2009 that the African American Film Critics Association Awards' co-founder and current president Gil Robertson IV appeared to have taken payments from studios in exchange for awards. The organization splintered with three founding AAFCA members creating the Black Film Critics Circle which they said would "maintain the integrity of a true critics organization."